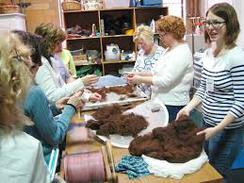 The alpaca fiber is processed the moment it is shorn from the alpaca. On shearing day, the 3rd Sunday in May, the fiber comes off the alpaca in three parts. Prime or the softest which is 1st, come from the back of the alpaca, 2nds from the the neck and rump of the alpaca and thirds come from the legs and belly. 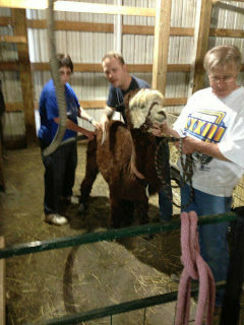 The alpaca gets vacuumed prior to shearing. The vacuum cleans out a lot of the dust and vm that the alpaca has gathered while rolling in a dust bath. After shearing the fleece is skirted, tumbled and washed. Skirting is where the fleece is placed cut side up, on a table that is covered with a screening type material. The screening will allow the dust, 2nd cuts and vm to fall out, throughout the screening and on to the table. While the fleece is laying cut side up, the unwanted coarser hairs are visible and easily removed. Carefully rolling the fleece to the other side, continue to look for unwanted hairs, second cuts, and vm. If your lucky enough to have a tumbler then place the fleece inside. A tumbler is a drum with dowels to pull and separate, to open the fleece and continue to shake the dust and unwanted fibers to the ground. At this point it is ready for the next step. The next step for the alpaca fleece could be: sold to hand spinners, sent to the mini mill to be processed into yarn, roving, or batting. Or processed here at the ranch. Once the alpaca fibers has been skirted, graded, and sorted we are ready to play. Using hand carders or a drum carder the fibers are picked and placed on the carder to a line the fiber. It’s kind of like brushing your hair to get all the hairs going in the same direction. The fun starts when you start blending different natural colors or dyed colors to create a batt or rolag. These batts or rolags then can be made into singles or plyed into yarn. 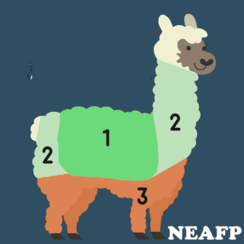 There are different methods to putting dye or color into the alpaca fiber. One can immerse the fiber into a dye pot to absorb the color. Or use a hand painting method to create lots of color for a special effect. The fiber has been dyed or left natural, blended in batts or rolags now it can be put through the spinning wheel or drop spindle. After that, you have made yarn. There are so many more options to make something from yarn. What will you make with your alpaca fiber?